Regardless of if you were a bride with a royal blood line from the early 1800's or whether you're a modern bride planning out your wedding for the upcoming season, your wedding dress is perhaps the most important keepsake from your big day. Many times it's the first item of clothing your significant other, and your guests, will see you in as the doors open and you make your way up to the person you'll be spending the rest of your life with. Wedding dress preservation has a rich history dating all the way back to the late 1700's. It is believed that wedding gowns began to be preserved in the late 1700's when royal weddings became very popular events across Europe. These ornate wedding dresses were adorned with jewels, lace and silk making for beautiful gowns but not so hearty in the preservation category. Silk and lace begin to deteriorate very quickly (known as silkrot), especially given the delicate nature of the way silk was produced in the early days. Unfortunately due to the delicate nature of the these fabrics and the lack of knowledge on proper preservation techniques, none of these early dress were able to be preserved well enough for us to enjoy today. 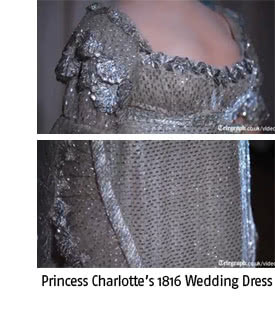 The earliest preserved wedding dress is getting close to being 200 years old and was warn by Princess Charlotte in 1816 at the famous Chapels Royal in St. James Palace. The dress has lasted much longer than her and Prince Leopold's marriage of only 2 years thanks to the painstaking efforts to keep the dress dry and out of sunlight by the royal staff. "It was made by Mrs Triaud of Bolton Street, from ‘cloth-of-silver’, silk bobbinet embroidered with heavy silver lamé, embellished with Brussels lace, and with embroidered flowers and shells festooning the hem." The cloth of silver gave the gown a beautiful metallic look that sparkled and dazzled guests as the sunlight though the stain glass windows shows down on her while walking down the isle. Their are many great reasons to have your wedding dress preserved. Even if your wedding dress has been sitting in your closet for the last 10 years, you can still have the Wedding Gown Preservation Team renew and restore your gown back to the day you first set your sights on it in the boutique. Give you children or grand children the option of re-wearing your wedding gown as styles come and go. We've re-preserved dresses that have been re-worn in thousands of weddings over the years. Humidity and sunlight both rapidly deteriorate delicate fabrics. The wedding dress preservation kit has UV protection and seam sealing built in to protect your gown against these elements. It's affordable! The Wedding Gown Preservation Company is the most trusted name in the preservation business and can save you hundreds of dollars as compared with using your local dry cleaner. Preserving your wedding dress is easy! 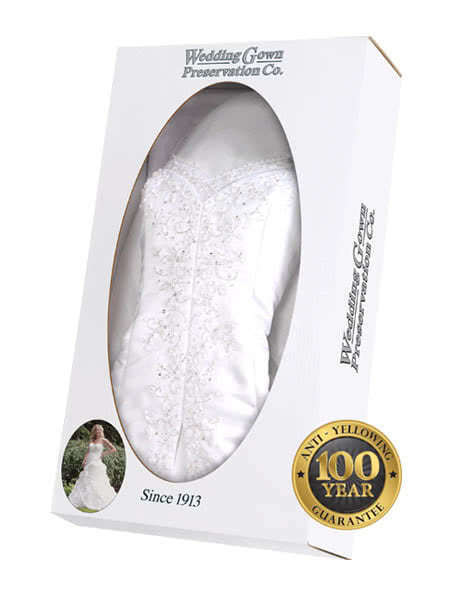 Simply decide whether your dress would be better suited for either our Traditional Wedding Gown Preservation Kit or our Celebrity Wedding Gown Preservation Kit and order from our website. Your order begins processing as soon as you place your order and you'll receive your kit within 5-7 days.